East Bay Rep. Eric Swalwell could be the next Democrat to enter the large presidential field, and the second with ties to the East Bay. 1. It took more than 60 Oakland firefighters to douse a massive fire in Oakland that destroyed an electrical and plumbing warehouse business on East 12th Street Monday morning, KGO-TV reports. 2. 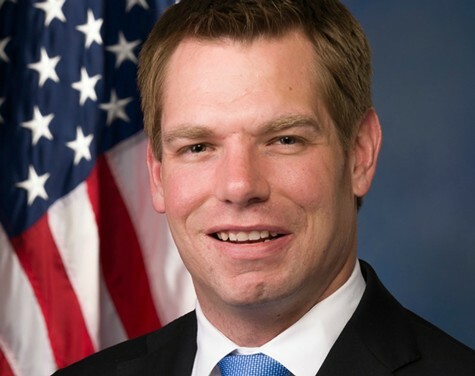 Carla Marinucci in the Politico California Playbook newsletter reports East Bay Rep. Eric Swalwell was overheard telling guests at his fundraiser last Friday in San Francisco, "Don’t tell anybody, but I’m announcing in two weeks." 3. Tesla agreed to pay a fine to the U.S. Environmental Protection Agency for violations at its sprawling Fremont plant, The Verge reports. Tesla left hazardous waste to accumulate on the property for longer than the 90 days allowed by law. 5. Alameda voters will head to the polls April 9 for a special election featuring just two ballot initiatives, KTVU reports. Measure A asks voters to reaffirm the City Council's decision to allow zoning for a wellness center for homeless seniors near Crab Cove, along with other services for the homeless in Alameda. Measure B would nullify the act. 6. Similar to East Bay neighbors in Oakland, San Leandro elected officials and progressive activists demanded the city divest from Wells Fargo because of its support for the Dakota Access Pipeline. A direction to cuts ties with Wells Fargo as the city's daily banking services vendor came up empty, the East Bay Citizen reports, potentially angering progressives and environmentalists. 7. Nobody exudes style more than Alfred Twu, who ran for the Berkeley City Council last fall while rocking a prairie dress and floppy hat. Twu's creativity also translates to board games, including one based on housing and planning issue in Berkeley, Berkeleyside reports.